Windows are important not just to let light in and keep out the weather, but also as a defining feature of a homes’ architectural style. Windows are categorized by several characteristics: material, number of panes of glass, method of opening, and any unique features. For example a wood, arch-top, 2/2, double-hung window has the following characteristics: (1) the sashes and frame are constructed from wood, (2) the top sash is curved at the top, (3) each sash has two divided panes of glass, and (4) both sashes move up and down. A key decision you will have to make is whether to repair or replace your windows. Historically speaking, repair is generally the preferred method. A tightly sealed, well-installed, high quality storm window installed over a weatherstripped and restored historic wood window can provide an excellent barrier against the weather. 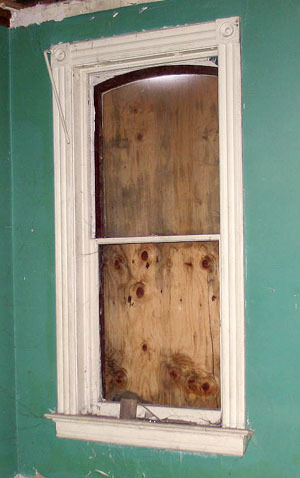 Repairing a historic window may involve replicating deteriorated pieces of the frame or sill, reglazing the sashes, weatherstripping, stripping/painting, and rehanging the counterweights. Reglazing a window and rehanging the weights are skills that can be learned by a novice. Replicating deteriorated wood pieces requires special tools and skills that may be better left to professionals or those with significant experience. In the event that the sashes are beyond repair but the frames are still in good condition, a millwork shop may be able to create replacement sashes for much less cost than a full replacement window. They may also be able to re-mill your existing sashes to accept insulated glass if you want to upgrade the glazing. If you must replace the windows, you will be faced with a myriad of decisions regarding the cost, style, construction, and efficiency of the replacement windows. Within the bounds of this overview, only some of these decisions will be discussed. The four major types of modern window construction are wood, aluminum/clad, fiberglass, and vinyl. Wood windows are usually the most expensive. The window frame and sash are made of wood. Most often the wood used to build today’s windows is not as high quality as that used when your home was built. In addition, the actual windows and mechanisms themselves are constructed differently. However, it is typically easier to get a wood replacement window that closely matches your existing windows than with other materials. Fiberglass is gaining market share as a lower-maintenance, durable window frame material. Some fiberglass windows can closely replicate profiles and appearance of historic windows. Others may have less detail or different proportions. Aluminum windows are constructed of extruded aluminum, usually with a factory finish selected from a small set of colors. Aluminum conducts heat, so it is important to have what is called a “thermal break” or gasket that prevents transfer of heat through the window frame. Materials and methods are advancing to the point where many historic window profiles can be created. Clad windows are typically wood with an aluminum “skin” on the exterior. The idea behind clad windows is to minimize required exterior maintenance (painting). Vinyl windows are the least expensive window option, but you get what you pay for. Vinyl windows come in a limited color palate will not last as long as well cared-for aluminum or wood windows. Almost all new single-hung and double-hung windows are friction mounted – very few use a counterweight system. Of the four types, wood and clad are typically the most expensive but also the most historically accurate. Some aluminum windows can also replicate the general look of some historic windows, but the standard color selection is more limited and arch-tops may not be possible. Vinyl windows are the least expensive, the least historically accurate, and will generally have a shorter lifecycle (regardless of what the salesperson claims). Square pegs don’t fit into round holes – Never replace an arch-top window with a square top window. They look ridiculous and diminish property values. Check local ordinances – If your house is located in a local historic district, never replace windows without the appropriate approvals. There are several neighborhoods in Des Moines where exterior alterations are subject to Historic Preservation Commission review. Never install an undersized replacement window just because you were able to get a “deal” – The sizes and shapes of your windows are a key component to the historic character of your home. In some cases it may be desirable to raise the sill (do so in a sensitive manner) in order to install new cabinets or make some other architectural change. Match the muntin patterns of your existing windows. Install shutters only in historically appropriate locations – Fasteners, hinges, and different brick color may indicate that there were previously shutters on your house. If you do, make sure they are appropriately sized. No shutters is preferable to incorrect shutters. Storm window size and shape should match the window behind – Never install two storm windows over a larger double hung window – it changes the character of the elevation. If your home is located in a local historic district, make sure you follow the City’s requirements for permitting exterior work! A window’s energy efficiency is difficult to determine because the window is only one part of the entire “building envelope” system to keep out the elements. Keep in mind that even the most efficient window will be ineffective if air can infiltrate through other openings. Look at your building as a system that is only as effective as its weakest component. Windows are one case where you have to balance the sometimes-conflicting goals of cost, efficiency, and style. If the decision is driven by reducing energy consumption, the first place to look is insulating the roof/attic, weatherstripping, and air sealing. Replacement windows, particularly vinyl replacement windows, will virtually never return the investment – if the actual return on investment is 40 years, but the window only lasts 20 years, it is a poor decision.